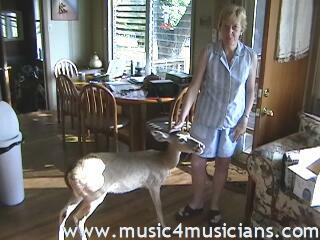 This deer likes to come into the house. She is quite good and hasn't caused any damage - yet! We feed her (and the other deer) on Record Rack Professional Deer and Elk Feed, as she is probably pregnant. She is also partial to oatmeal cookies. Here's a large file that plays on Windows Media Player in 640x480 size. Click on the picture below to start the video. Click HERE for a smaller file.